Growing up in Nebraska we used to have frequent Tornado drills at school. As I got older and they became more routine, they were almost a fun break from the monotonous school day. But, as a little girl, I remember being somewhat terrified of these drills, when we would have to hide in the stinky boys bathroom not knowing for sure if this would ever truly happen in real life. Today, I'm the proud parent of two little boys, ages 4 and 6. Lock down drills have become a standard practice at their schools. The drill consists of pulling the curtains down and having the children hide in places in the classroom in hopes that a potentially armed person hoping to do harm would look in and assume the class was in another part of the building. My heart breaks for the small children and what their little minds must be thinking during these moments where they are told to remain still and to try not to make any noise at all so as the bad guy wouldn't find them. The school sends out an email to all parents in the days before the drill and these emails will NEVER not make me sick to my stomach. I cannot even begin to imagine what it is like to be a parent of a child in Parkland. I hope I never have to. The sad reality is that this is our reality. My tornado drills have become my children's lock down drills. And what really gets me? The tornados that frightened me as a young child were mostly out of our control (we'll talk about climate change another day). These mass school shootings are part of systemic problems that we CAN change. That so many American boys are broken shouldn't be lost on any of us - and it's especially poignant for me as I hope to raise my own boys to be strong and determined men, who are also sensitive and kind men. There are, of course, other things at play, like the failure of our society to recognize, take seriously, and help those struggling with mental illness. However easy it may be to place blame on the aforementioned, there is one thing that we can do as a society to make our students safer right now. And that is to reform our gun laws immediately. Enough is enough. Please use your voices and the power of your votes to help stop the violence that is plaguing our children and our schools. Email us to order this "enough" sweater in any color. 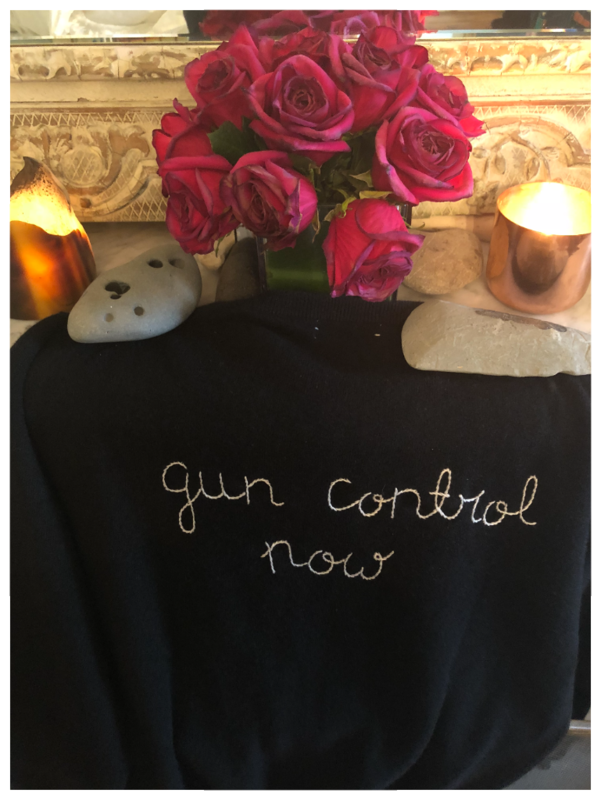 It has "gun control now" on the back and send $100 to everytown.org. p.s. Today is the first day back for many students in Parkland, FL. 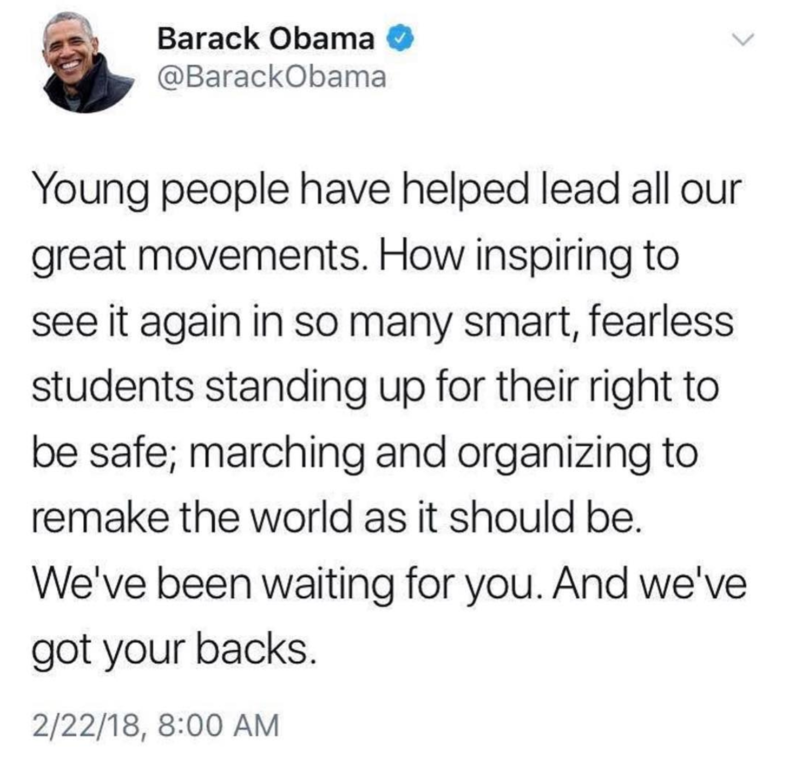 We want them to know we've got their backs. We are thinking of them, sending love to them, and determined to vote for change in our nation's ridiculous gun laws.